Our Sunday Afternoon Applique Group met this past Sunday and I thought I would share with you some of the projects that we are working on. Kathy has been busy stitching, of all things, a bridal veil for a friend. Kathy is the one modelling the veil and I am the bridesmaid, making sure that the veil is lying perfectly flat! In her spare time, Kathy has also managed to prep a few blocks of her “Aunt Millie’s Garden”. Christie has been very busy stitching the Cardinal block of “To Everything There Is A Season”. Lovely! Lynn has been working away on her blocks of “To Everything…” and this is the beginning of the Summer Vase. I have been working on the centre medallion of “To Everything..” The pieces are bigger than the ones in the blocks, so it is working up quite quickly! I am also working away on my hexie quilt, which is starting to take shape. How Much Fabric Should I Buy?? This is a question that I am asked from time to time and I thought it would make a good blog post. First, let me take you on a bit of a tour of my sewing room where I keep all of my fabric. I make no apologies for the size of my fabric collection. A painter has to have her paints, right? I have a stash of tone-on-tones in clear colours, which I used to make my Friends of Baltimore. I also used these same fabrics for the blocks of “To Everything There Is A Season”, but I added a few batiks and a few fabrics with a bit more of a design on them. I keep these fabrics in containers and I keep telling myself that if I just folded each fabric after I used it, it wouldn’t be quite so messy! It is always a good idea to have a good variety of colours in light, medium and dark. I am always on the hunt for new fabrics and new colours. I purchased these tone-on-tones recently, just to add a few more to the stash. When I am purchasing tone-on-tones with applique in mind, I rarely buy more than a fat quarter. Fat eighths are even better! These tone-on-tones can range from looking almost like a solid, to having a bit of a swirl or even some dots! If you are just starting to build an applique stash, I highly recommend purchasing layer cakes, which are 10″ squares of an entire collection. Layer cakes also takes the pressure off of choosing fabrics that “go together”, and a 10″ square is the perfect amount! You can also add tone-on-tones to these collections of fabrics. For my Civil War Bride Quilt, I used a more muted pallete. Since I didn’t have a lot of these muddy colours, I had to go on a few shopping trips to make sure I had a really good assortment. Again, I purchased mainly fat quarters and fat eighths. When I think that a fabric has a lot of potential for fussy cutting, I usually buy at least 1/2 a meter. You can see that I used fabrics with a much larger print on them and very few tone-on-tones. Most of the greens I used in this quilt came from a layer cake of Civil War greens. When I made my Aunt Millie’s Garden, I used my collection of brights, which include stripes and polka dots. I find these types of fabrics are easier to buy in a fat quarter bundle (or even better…a fat eighths bundle!) so you get a good assortment of fabrics with the same “feel”. When it comes to backings, I always make sure the back matches the front! Today Hubby and I spent a bit of time picking out some porcelain tile that is to be installed at our front door and mudroom. No matter where I go, I seem to always see quilts designs….I have always loved clamshell quilts and one day I will make one! If this were my backsplash, I would be reminded of how much I love hexies while I am doing the dishes! And, finally, isn’t this the perfect pattern for an appliqued quilt? Inspiration is everywhere!! Last week, I started the final (!) border of Sue Garman’s “Friends of Baltimore”. I would love to have this border finished by the end of the year. We will see….First I picked out the fabric for the vase. I like to start with the vase because it just feels like such an accomplishment once it is completed! This is one of my favorite fabrics. Do you recognize it? I used it for a vase in my Civil War Bride Quilt. Notice the pattern is running up and down. I used the same fabric for the vase in my “Bouquets For A New Day”. In this vase the pattern is running sideways. And here is the fabric for the third time! Now on to the fun part. All those curved pieces at the bottom of the vase need to line up properly. I did the same thing I did in my last post about lining up the pieces of the pine cones. First, I removed the freezer paper template from the prepped pieces. Next, I placed the template shiny side up on top of the prepped piece. Then I used a sharp white marking pencil and drew the seam allowance on the pieces. Can you see the white line? This just makes it so much easier to place the pieces in the correct spot. It’s such a nice feeling when things line up properly! Next, I added the top of the vase and the curvy section on top of it. Then I started to add the stems, leaves and flowers! Third Finish of the Year! …and my second finish was Civil War Bride..
…and added half a scoop of Oxi-Clean. I let the quilt soak for about an hour, swishing it around with my hands now and then. I used a wool batt so once the quilt was wet, it smelled very much like a wet dog! I let the water drain out, rinsed the quilt under the tap (the quilt was very, very heavy) and pressed out as much of the water as I could. I carried it downstairs where I had laid out a thick, clean blanket. I placed the quilt on the blanket and smoothed it out, making the edges as square as I could. Even though I squeezed out a lot of water, within minutes the water was starting to be absorbed by the thick blanket. I could have used towels, but I didn’t have enough clean towels at the time! As you can see, even after soaking for an hour, the marks left behind from the Frixion marker did not come out, but I had a plan for that! …and after I steamed it. Magical! Ice cream and stitching go together!! Canada Day is always a busy weekend for us because it is also our wedding anniversary. So, there is always lots to celebrate….and lots of cake and Canadian ice cream! Even though it was a busy weekend, I still found some time to do a bit of stitching. When I finished the second border of Friends of Baltimore, I decided to take a bit of time and do some catch-up on a few projects. This is my second block of the Value Proposition Quilt Along, which you can find on a wonderful blog called Faeries and Fibres. Just click on the button at the top of the page called Quilt Alongs by Karen H. Concentrating on value (rather than colour) is more challenging than you might think! I also took the time to stitch the first two rows of my hexagons together. I really am loving this whole hexie thing…can you tell?? So next, I decided to tackle the corner squares of Friends of Baltimore. To account for shrinkage, (which does occur) the four borders on this quilt are all cut the same length…. …..which means a corner block is needed. Some of the applique on the borders flows onto the corner square and cannot be stitched until the corner block is stitched to the border. This will make more sense as we go along. Trust me! Now onto the corner block! I always like to start with the vase or the basket. I think it sets the tone of the block. When I bought this gold fabric, I thought it would make a great vase. It also made a great butterfly on my Civil War Bride quilt! Now, I am just filling the vase with flowers. Sweet! ….becomes this! For those people who have asked how I prep my pieces, you can see more here. Once the pieces are prepped, I use a dab of glue and attach them to the paper pattern. I do this for a few reasons…one is so I can make sure I prep all of the pieces and don’t forget any. The second reason is so I do not lose any pieces (been there, done that!). And I can preview my fabrics, which is especially useful when doing multi-couloured flowers. Once I get a section prepped, I am eager to glue it to the background and then I stitch it in place. I find it easier to break the process down into smaller chunks rather than to try to do the prepping all at once, then all of the stitching at once. That is just the way I work! Yes, I have been hexi-ing! I have a special project in mind! And finally, I am in the process of turning the last(!) corner of Circle of Tulips. So exciting! 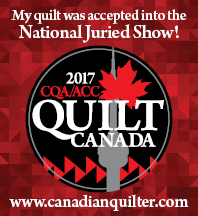 Speaking of excitement…my Civil War Bride Quilt received a ribbon at the Plowing Match Quilt Competition! All quilts that received a ribbon will be exhibited in the Lifestyles Area at the 2014 Simcoe County International Plowing Match and Rural Expo September 16-20, 2014. Sweet! No one, but TWO finishes!! Oh my! I am so excited! Here it is just the end of March, and I already have two finishes! First, Owen’s quilt. Beautifully quilted by Colleen at Elite Quilting. And, here is the back. For the lettering, I just printed “Owen’s quilt” in Illustrator and prepped the pieces just like I would prep any other shape. Remember this? And here is my Civil War Bride quilt breathtakingly machine quilted by Rose at Elite Quilting. I wish you could see this in person!! Whenever I ask Colleen to machine quilt a quilt for me, she always asks me what design I have in mind. This is the look I give her…. …and then I say, “I don’t know…whatever you think”. As you can see, my input is not needed at all! This is the backing I chose…I found it on sale for $6 a yard. I bought the whole bolt!! I am also very excited to announce I am just putting the finishing touches on the first block of my first Block-of-the-Month called “To Everything There is a Season”. It is a quilt designed by MT Designs exclusively for Simple Bird Studio. Would you like a hint or two? Well, the quilt consists of twelve 18″ blocks. And a center medallion. There is a cardinal, a squirrel, a hummingbird, a basket of poinsettias and a wreath of roses…among other delights. Look for it next week!